Mobile Bay Convention & Visitors Bureau | Gulf Shores & Orange Beach Tourism | North Baldwin Chamber of Commerce | Mobile Area Chamber of Commerce | Eastern Shore Chamber of Commerce | Central Baldwin Chamber of Commerce | South Baldwin Chamber of Commerce. Show respect by minimizing your presence and impact in all ways. Take pride in the ability to pass through the area without leaving any sign of your presence. Never discard garbage or food scraps along the trails no matter how small or insignificant they may seem. Such items pollute the environment and attract unwanted animals. Avoid disturbing wildlife (and other visitors) by keeping quiet and not approaching them too closely. Avoid disturbing plants and other natural features by leaving them in place and building fires only at designated sites. Deposit all human waste in a toilet. Campers on overnight canoe trips are required to use portable toilets between facilities. For information about how to enjoy the outdoors while “leaving no trace” visit www.LNT.org. Public use of all water routes within the Mobile-Tensaw River Delta are greatly influenced by water levels of the area’s rivers. Trail routes within the northern portion of the Delta are especially influenced by water levels on the Alabama River. The first upstream impoundment on the Alabama River from the Delta is Claiborne Reservoir. Operation of Claiborne Dam by the U.S. Army Corps of Engineers is the single most influential structure affecting the water levels on the upper Delta. Review the information provided with the respective trail descriptions for optimal water levels. This information is helpful in trip planning and trail selection. For water level information at Claiborne Dam check the U.S. Army Corps of Engineers’ Water Management website. The U.S. Geological Survey also maintains a network of stream monitoring gages. To check any of these gages, visit USGS' Current Water Conditions Dashboard. Water levels in the lower Delta are less influenced by upstream dams, but will be influenced by daily tidal variations and seasonal (winter) low water levels. Check local tide charts, particularly during winter months with north winds, to make sure a falling tide does not leave you stranded in the back of a slough! 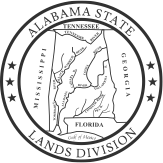 Each year, the Alabama Marine Resources Division publishes a Marine Information Calendar for coastal Alabama. It can be downloaded here. Water level information for the Perdido River Trails can be found here. Perdido River levels typically range between 2 and 6 feet, with flood stage occurring at 13 feet. While most canoeists and kayakers paddle our waterways without mishap, visitors need to be aware of and prepared for potential hazards. Carry first-aid and survival kits. Keep them secure and accessible, and be familiar with their use. Alligators: American Alligators are common to coastal waterways, and offer visitors a unique opportunity for wildlife watching. Beware of your surroundings, the time of the year, and alligator behaviors. Never feed alligators or approach a nest. On occasion, visitors may find an alligator uncomfortably close to or completely blocking the path. This is most likely to happen when an alligator hauls out to sun on the bank of a narrow section of trail. Avoid trying to pass quietly by an alligator in this situation. If the alligator suddenly feels threatened, it will likely dash to the safety of deep water by the most direct route. If the alligator does not feel threatened until visitors have paddled alongside, it may “escape” directly toward visitors. Never get caught in the path of an alligator’s escape route to water! Becoming lost: Once off-trail, there are a few helpful landmarks from which to regain bearings in the Delta. Moving from North to South, all trails cross several man-made features, including power line Right-of-Way (ROW), Gas line ROW, I-65 and the L&N railroad trestle. Utilizing these landmarks and maps the user can navigate back on course or to one of the several landings in the area. Aside from extremely remote bayous and creeks, most waters are frequented by small motorized craft on a regular basis. Another good idea is to have a float-plan buddy (someone not on the trip) with whom visitors can leave a trip itinerary and whom visitors can inform of a safe return. Trail Blockage: Each new thunderstorm or high water event can result in trees falling into the rivers and creeks of our trails or creating logjams that block navigation. While Conservation Department staff make efforts to remove blockages, trail users should be prepared for the possibility of having to portage around such hazards. Use caution when exiting the vessel and walking over or around downed trees or logjams. Please report trail blockages to the State Lands Division staff at the 5 Rivers Delta Resource Center at (251) 625-0814. Heat exhaustion and Heat stroke: Heat exhaustion and heat stoke are real possibilities. Be aware of their symptoms and the course of action one should take if a partner exhibits symptoms of heat related problems. Drink plenty of water and avoid strenuous activity during the hottest part of the day. Hypothermia: Be aware of the symptoms. A dry change of clothes, dry sleeping bag, and dry tent are essential, when treating someone with hypothermia. Keeping these items in dry gear bags is a good idea when traveling in the Delta or on the Perdido River. Biting Insects: Mosquitoes and deer flies (locally known as yellow flies) are the most bothersome of the swamp’s biting insects. Mosquitoes can be active at any time of the year during suitably warm weather, but are most numerous from April through October. Deer flies are at their worst from May through September. Venomous snakes: Six different venomous snake species occur in the coastal Alabama: Florida Cottonmouth (Water Moccasin), Copperhead, Eastern Diamondback Rattlesnake, Canebrake (Timber) Rattlesnake, Dusky Pygmy Rattlesnake and Eastern Coral Snake. Click here to learn more about Alabama's venomous snakes. Thunderstorms and lightning: Thunderstorms are common afternoon and evening occurrences from May through September. Cell phone service: Since our trails are located in rural areas, cell phone service is limited. Service improves the closer you are to highway corridors. You might also seek higher ground if unable to hold a signal along the river bottoms.